Unisex. 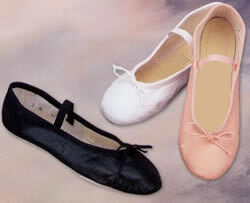 Large size ballet shoes by So Danca. All leather uppers, full sole with pleated toe. Draw string and elastic attached. These shoes come in European sizes PLEASE read the note below. SIZING NOTE: LADIES ORDER 2 FULL SIZES SMALLER THAN YOUR REGULAR USA STREET SHOE SIZE. MEN ORDER 1/2 Size LARGER THAN YOUR USA STREET SHOE SIZE.